In today’s job market, every little bit helps. Having a list of references ready to hand to a potential employer is one way to show that you think ahead and are prepared. Using this free resume references template will ensure that you don’t leave out important information. It is easy to use and customizable so you can adjust it to match the look and feel of your resume. Just click on the link to download a copy of the resume references template and get started right away. 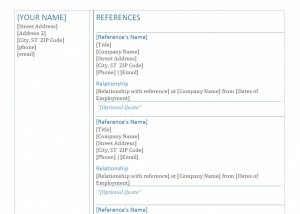 Fill in all relevant contact information for each reference in the resume references template. Be sure to double check the information to make sure it is correct. Include the reference’s title, name, phone, e-mail, and physical address to give the potential employer several options for contacting your references. Include some information indicating how the reference knows you. In general, these should be people with whom you have a professional relationship. Third, consider obtaining a quote from the reference endorsing you. This only needs to be a sentence or two, and can highlight a particular skill or talent that you possess. Another option is to simply indicate the skills or abilities to which the reference can attest. Employers want to see professional references, but avoid using current employers or coworkers, especially if they don’t know you are job hunting. Ask previous employers, coworkers, clients, vendors, supervisors, teachers or professors. Also consider anyone with whom you have worked in charities, scouting, or your place of worship. If you are just starting out and have a short list of professional references, consider personal references such as neighbors, pastors or acquaintances who can attest to your character. Make sure all of your references are happy to endorse you. Even if they have in the past, it is a good idea to call them and ask so they aren’t surprised when a potential employer does call. Also double check the contact information and find out how the reference prefers to be contacted. Having a reference sheet available is a great way to make a wonderful first impression. Use the resume reference template to keep the task simple.